Tomorrow the IT giant will announce its Q4 earnings. The volatility has already shot up more than 50% from it normal levels. 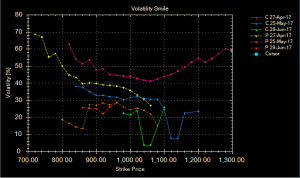 Have a look at the current month volatility smile chart! The curve is so prominent, that tells us the current month vega has turned up! The expected move for beta calculations lands to 5% in either direction! As the volatility is too high we will try to take advantage of the high vega and form a strategy that will be delta cushion plus vega short. The best strategy to trade in these high vega environment is “short strangle”, the strike price is taken into consideration by calculation of “beta expected move” of the stock. Selling 1020 CE and 920 PE in the same quantity will lead to formation of the strangle in INFY. The upper and lower protection levels are 1045 and 894, as long as the price remains between this zone, no delta damage will be done to the strategy. The vega will go down drastically after results are announced, therefore will be beneficial for us, as we are vega short in this strategy. If we look at the price chart the daily chart of is at an important support levels of 61.8% levels and prices have managed to turn from these levels! Yesterday a harami candle was formed! That indicates the uncertainty in the counter. The 985 and 1005 levels are very strong resistance for the stock as of now. Till prices remain below these levels, limited upside is expected! 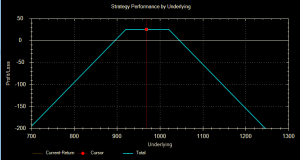 The above option strategy can be a good bet to trade the increased volatility! As soon as the results are announced, exit from the strategy. No use of carrying any legs, as due to reduced vega, the legs will loose value. Stay updated for strategies like these. Download our Trading Application. Enjoy host of service FREE as of now.